So starved it didn't occur to me to take a picture before I started eating. Sorry. I've spent most of today in bed, keeping my cat Kelly company. She's due to give birth at any time - I'm guessing sometime in the next two days. She likes me to be close, and preferrably rubbing her tummy. The kittens are kicking and rolling inside her tummy, they feel like little aliens trying to get out. Also cat-related - we were at a cat show yesterday, and did really well. Yeay for us! All the cats (we had five offspring there - our own Glinda, two of her littermates, and two of our older offspring, all with their new owners) got great individual judgings, and one was even nominated for the final. To top it off, I won the best breeder award for the shorthairs - very, very fun! I went home with a truckload of kitty food, candy and toys. So my sleeping in today was very well-deserved. For dinner, we fixed a new recipe from Jamie Oliver's Jamie's Dinners. I know I'm totally pushing this book at you - but seriously, everything I have tried from it so far? Delicious. Incredible. And easy. I do love it. This recipe was certainly no exception! Per read it, sighed and said that he didn't really like spinach. At all. I insisted, so we still fixed it.. and he nearly licked his bowl for more. I'm giving you the quantities I used - it made two very large portions, and would certainly be enough for 3, possibly 4 if you're not very hungry. But we were. Cook the pasta in your normal way. Meanwhile, get a large pan and melt the butter and oil. Add the garlic and nutmeg, and when it's warm, add the spinach. Let it wilt for 3-4 minutes. Season it with salt and pepper. Add the mascarpone and the cream, and a little bit of pasta water. Season again, if necessary. When the pasta is done, drain it and RESERVE SOME WATER. That's important. You need it. Add the pasta to the sauce, mix well, and add the parmesan. Mix again, and loosen it with several glugs of pasta water, added gradually. You want a soft, silky sauce, not a thick mess. Serve immediately - this can not wait. mmm sounds decadently creamy! 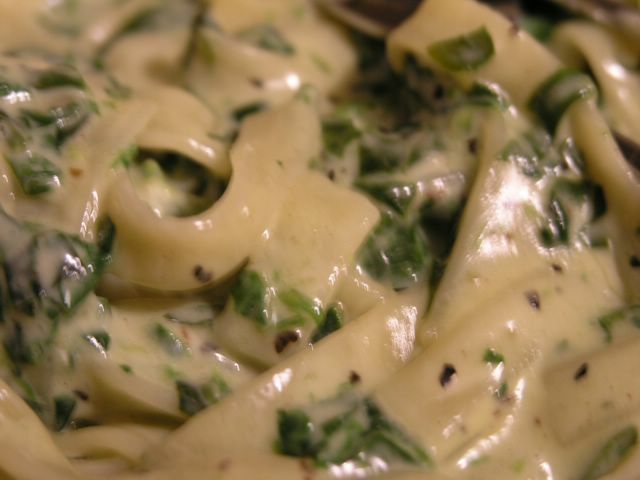 i love spinach with my pasta and the dash of nutmeg sounds great. im inspired! i dont have marscapone on hand but maybe i could substitue greek yogurt? what do you think? Greek yogurt works really well in sources, I use it all the time :-). It will work just as well as the marscapone.... enjoy. The details will be at cheapgreengourmet.blogspot.com when I put them together. isn't it a little bit too much? oil, butter, cream and mascarpone? Don't get me wrong, I love creamy sauces, but this seems a little too creamy... Doesn't it kill the taste of spinch? Doesn't it all just make it bland? 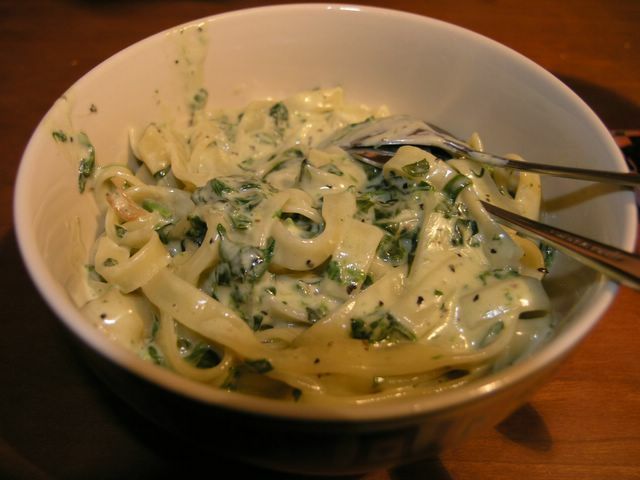 Anonymous - it is rich, and just mildly spinach-tasting, that's definitely true. I'm afraid I haven't made this in several years though, it was six full years since I posted this, and I dont remember exactly. I should make it again though - I remember is as not at all bland, but creamy and comforting. And very filling!